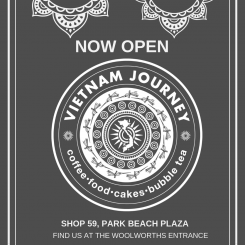 Vietnam Journey is now officially open at Park Beach Plaza! Offering superb Vietnamese meals, coffee, cakes and Bubble Tea. Come say hi to Kien and Loan and try Vietnam Journey for yourself! Find them at the Woolworths Entrance at Park Beach Plaza.